Sunken cities are typically the stuff of legend, but now archaeologists have found the real thing hiding deep within Lake Van (above) in Turkey. After a decade of searching the Middle East’s second largest lake, the home of a lost kingdom has been found hundreds of feet beneath the surface. Archaeologists from the Van Yüzüncü Yil University announced the incredible discovery – a vast 3,000-year-old castle preserved deep within the lake in amazing condition. The researchers worked closely with an independent team of divers to find their prize. Lost underwater cities and castles are a popular motif in folklore and local legend around the world. Indeed, so are stories of ancient lost monsters hiding in deep lakes. Tahsin Ceylan, head of the diving team on the project, first came in search of the Lake Van Monster, but uncovered a lost city instead. “There was a rumor that there might be something under the water but most archaeologists and museum officials told us that we won’t find anything,” he told Daily Sabah. The castle spans around approximately ⅔-mile, with walls standing as high as 9 to 13 feet, kept in good condition by the alkaline waters of the lake. It is, the researchers believe, an Iron Age relic of the lost Urartu civilization, also called the Kingdom of Van, which thrived in the region from the 9th to the 6th centuries BC. The water level of the lake, however, has fluctuated quite dramatically over the millennia, and the researchers believe the level was far lower at the height of the Urartian society than it is today, slowly rising over time to cover parts of the city. Other parts of the ancient settlement are much higher, even above the current shoreline, and are the subject of ongoing archaeological study. The work is slowly paying off. Last year the team also discovered a 2.5-square-mile field of stalagmites they call “underwater fairy chimneys” beneath the lake and gravestones from the Seljuk era, some 1,000 years ago. Earlier this year they announced the discovery of a Russian ship believed to have sunk in 1948. The lost Kingdom of Urartu is shrouded in mystery because very little is known about this ancient place and the origins of its people. The Hebrews referred to it as Ararat and in more modern times it has been named Kingdom of Van. The kingdom’s beginnings are lost in the mists of pre-history, but before it was destroyed, Urartu was situated in Eastern Turkey, Iran and the modern Armenian Republic. The earliest documentary mention of the land of Urartu can be found in Assyrian sources. Based on what we know, the people of Urartu were famous metalworkers, spoke a language that was related to Hurrian (a language that has no other known connections), and they adapted the Assyrian cuneiform script for their own purposes. Ruins of Urartu. Although it cannot be said with certainty, it appears that from the 9th century forward, Urartu was ruled by a single dynasty, which expanded three kingdoms to the south in a period when Assyria was weak. The true origin of the people of Urartu is unknown. Some historians believe these people people migrated from somewhere to the west into the Armenian plateau, then for the most part, known as Nairi. They called themselves Khaldians or children of the god Khaldis, just as the name of the Assyrians reflects the name of their god Assur. “The oldest states of the Soviet Union were founded 3,000 years ago to the south of Transcaucasia. 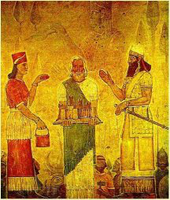 The oldest among them, that in the Ararat area, by the Lake of Van, was called Urartu. Its kings ruled over Georgian tribes,” Professor Shestokov, a Caucasian author, wrote in 1939. In 1827, German scholar Friedrich Eduard Schulz made the first known attempt to study the ancient ruins. Schulz made copies of a number of inscriptions and had these sent back to Paris. Unfortunately Schulz and his party were attacked by bandits in 1829 and he was killed. Schulz’s copies were not published until 1840 in Paris, where there were shown to be various inscriptions in Ancient Persian and Assyrian cuneiform, itself not fully translated, while the remainder of the inscriptions were in an unknown language. In 1847 and 1850 new copies were taken of the inscriptions. Several attempts have been made to decipher the cuneiform inscriptions of Armenia through the present-day Armenian language. The failure of these attempts has led some to believe the inscriptions in question must be in some unknown, alien tongue, neither Indo-European nor Semitic. Sooner or later everything must come to en end, and so did the existence of the Kingdom of Urartu. The fall of the kingdom is shrouded in darkness. It succumbed in around 585-590 BC, however, there is no written account of this event and this timescale is not undisputed. Archaeologist Boris Piotrovsky who headed the excavation of the city of Teishebaini, now Karmir Blur in modern Armenia, discovered remains of a city that was besieged and consumed in a great conflagration during a final night attack. He also uncovered several treasures and everyday artifacts that were taken to the citadel when the city was attacked. Urartu artifacts. Obviously people of Urartu knew their kingdom was about to vanish and made a last attempt to hide some precious objects in hopes these would survive as a reminder of the their existence. Unfortunately, a large number of these artifacts, including most of the inscribed objects, have not been excavated. For example, many Urartian cemeteries with their hundreds of grave goods have been robbed, while only a few (such as the cemetery at Altintepe) having been properly excavated. This means that archaeologists have been deprived of a complete and contextual knowledge of the culture and precious history has been lost once again. This brilliant era of Urartu did not last long and the kingdom disappeared rapidly from history. Sources: Michelle Starr, ScienceAlert, November 21, 2017, and AncientPages, June 22, 2014.